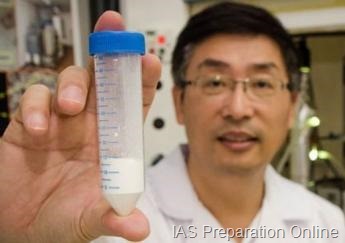 Chinese scientists have placed another milestone in the field of science by discovering the lightest substance in the whole world that has a density of one six of the density of air. The substance is named as carbon aerogel. The scientists at the Zhejiang University have produced the solid material with a density of 0.16 mg/cubic centimeter. The material has broken all the pre-existing records of graphite aerogel, of being the lightest material. Aerogel is a material which is created by drying the semi solid gel and removing the solvent. The material is visible in solid state with many of its inner poles filled with air, which accounts for its minimum density. The former lightest material was developed by the German scientists in the former year. It was developed with a density of 0.18 mg/cubic centimeters. The team freeze-dried the solutions of carbon nanotubes and graphene for removing moisture and keeping a hold of its integrity. Professor Gao said that the structure of carbon aerogel is same as carbon sponge. When an aerogel equivalent to a mug in size is kept on Setaria, there is no bending seen in the slender glass. Though it appears to be fragile, carbon aerogel is highly elastic and can bounce back after facing a compression. In addition, it’s one of the materials with biggest oil absorption capacity. Current oil absorbing products can usually absorb organic solvent of about 10 times of their own weight. The carbon aerogel newly developed can absorb up to 900 times their own weight. In addition to pollution control, carbon aerogel is expected to become an ideal material for energy storage insulation, catalytic carrier and sound-absorption. Hey there would yoou mijnd letting me know which webhost you’re utilizing? I’ve loaded your blog in 3 different web browsers and I must say thgis blog loads a lot quicker then most. I amm coming back to your site ffor more soon.